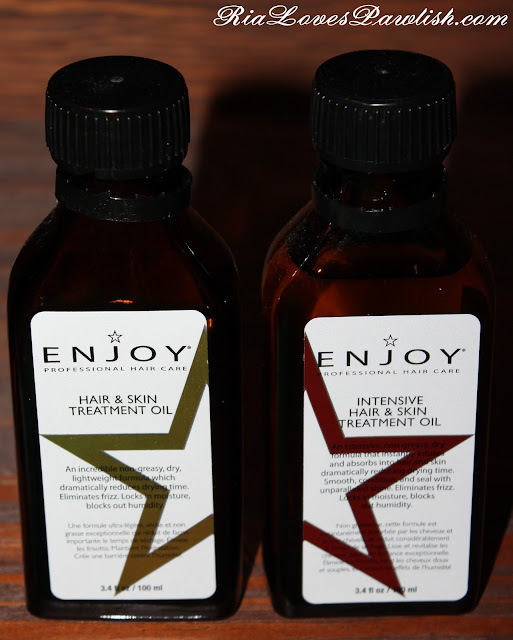 today i wanted to share a couple of my favorite hair products with you all, Enjoy Hair & Skin Treatment Oil and Enjoy Intensive Hair & Skin Treatment Oil. i use the Intensive Treatment right after i get out of the shower and my hair is still wet (it's much more thick than the original, so it applies more easily to wet hair! ), and the regular treatment after my hair is dry. i use the regular most nights, it absorbs really well into hair. after my hair got really damaged from bleaching and was completely dry and falling out in hanks, these products were recommended to me by my California stylist... and i'm so glad! these oils are absolutely amazing, my hair is MUCH healthier now... plus, i can i just put oils in it and let it air dry and it's not frizzy, a first in my whole life! i don't use either product as a skin treatment, but both make my hands feel nice after applying them in my hair. i also really love the scent of the regular, it's very citrusy! the downer of these products is that they are quite spendy, the regular retailing around $30 and the Intensive around $45. to me, the results are completely worth the hefty price tag. plus, you don't need very much to do your whole head, i use less than a quarter sized amount! here's a look a the bottles! i love how Enjoy products are packaged to match up and form a complete star with complimentary products (like the same type of shampoo and conditioner!). i love stars and i'm just a sucker for cute packaging. check out www.enjoyhaircare.com to find Enjoy salons and also learn about all their other products. i like to buy Enjoy at Ulta since i earn points there, of course!